Microsoft has released a minor update to the Remote Desktop app for Windows Phone, fixing a few issues but also bringing support for Azure RemoteApp to your device. For those who are not familiar with Azure RemoteApp, this is the cloud-based solution for applications for businesses so they can have them in a centralized location but be accessed remotely via devices running Windows, Mac OS X, iOS, Android and Windows Phone. Your company’s applications run on Windows Server in the Azure cloud, where they’re easier to scale and update. Users can access their applications remotely from their Internet-connected laptop, tablet, or phone. While appearing to run on the users’ local device, the applications are centralized on Azure’s protected, reliable platform. For those of you who have been around Windows business solutions for a while, think of this as a really advanced, highly stable, Windows Terminal-like solution. Just really, really big. manipulation on a small screened device can be tricky, the object here is to give you that access if you need it while you are away from your office and your PC. 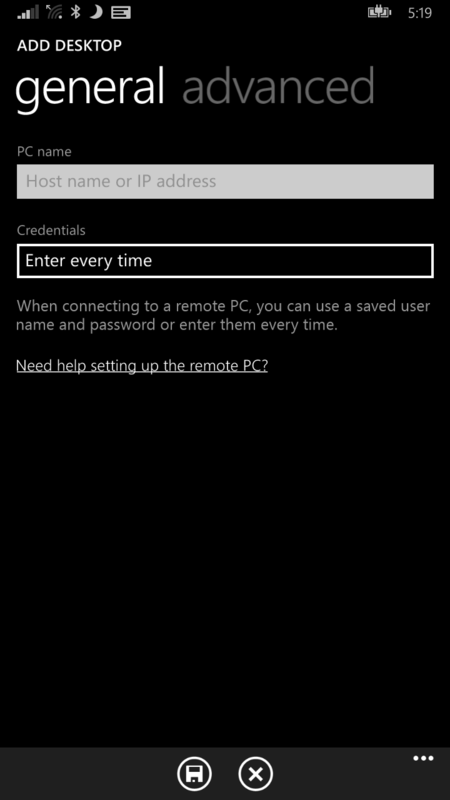 If you remember, last month I posted a How To article on how to configure the Remote Desktop app for Windows Phone to access your PC. Fundamentally, it will work the same with Azure RemoteApp, you just need to log in with those credentials to get access. In addition to bringing Azure support, the app has also received the mythical “Bug fixes and other improvements”. What specifically those items that were addressed are not stated in the release notes for this version. The Remote Desktop app for Windows Phone is available now in the Windows Phone Store and it is a free download. Technically this is still listed as being a Preview app (i.e. Beta) but I’ve found it to be quite stable in my use and testing of the app.